Ladies and gentlemen, allow me to introduce a bodacious burger bonanza. I bring you The Big Onion Burger, or, as I've dubbed it, "The B.O.B.". This is one man's answer to a monster burger craving on a lonely Sunday night when the family is out of town. 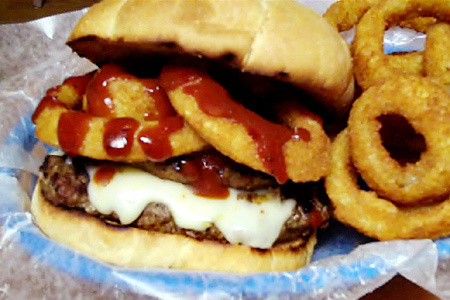 Whoever first dreamed up the idea of putting onion rings on a burger is certainly deserving of this country's highest culinary honor. This is basically a double-decker version of my Western BBQ Burger with a few twists. I replaced the cheddar with pepper jack, the grilled onions with onion rings (obviously), and the standard BBQ sauce with a hot version. Note: I apologize for the poor picture. The good camera is in SoCal with the ladies. WOW! That is so huge.lol. Anyways, Its looking delicious! I'd love to try this at home. Thanks for the recipe. You amazed me with this one. That is a thing of beauty. You knocked this one out of the park, John. I mean you always do good, but this one was over the top good. Thanks, Chris! It was just one of those spur-of-the-moment culinary indulgences. I'll be doing a couple more gnarly burger posts in the near future. Oh my goodness, I want that in my belly right now! NOM NOM NOM NOM NOM..
That's huge! I just love it. Picture is looking so yummy! Its looking delicious! I'd love to try this at home. Thanks for the recipe.